Judge Mark Mandio presides over Riverside County's Veteran Court. On Memorial Day, 19 veterans graduated from Riverside County’s Veteran Treatment Court after completing an intensive 18-month treatment program as retribution for past crimes. The graduates, who were once charged with minor offenses, now have sealed criminal records and can move on with their lives with a renewed purpose and access services that otherwise would have been elusive to them prior to their conviction. 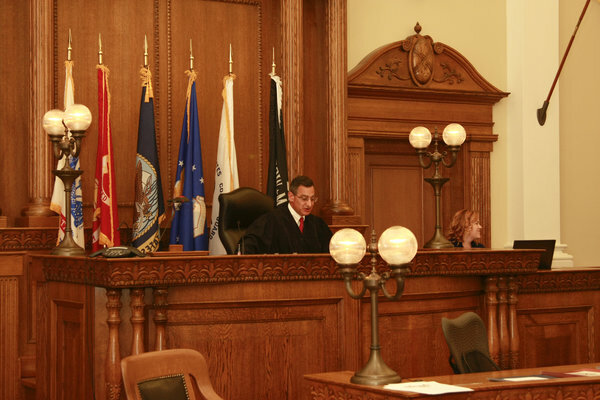 Veteran treatment courts are collaborative courts that offer veterans rehabilitation as an alternative to incarceration for mid to low-level misdemeanors and felonies. Not all veterans are eligible for admission to the treatment-based program and eligibility requirements vary from court to court. However, participants who suffer from post-traumatic stress disorder, traumatic brain injury and other diagnosed mental disorders have a good chance of gaining admission to the program if there’s evidence showing their crimes are directly linked to mental disorders. With the help of Veterans Affairs, the California Veteran Legal Taskforce, the District Attorney’s Office, and the Probation Department, Judge Chittick created Fresno’s first veteran court in June 2016. 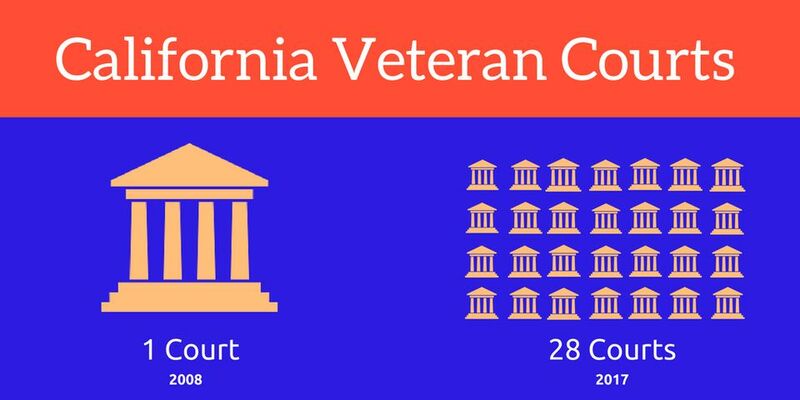 In 2008, Orange County opened the first veteran court in California. Since then 28 veteran courts have sprung up in 24 counties. Nationwide, there are roughly 300 veteran courts. Judge White helped establish the county’s first veteran court in 2010. It began as a pilot program, but with the help of community partners, the court has become a boon to veterans wanting to get their lives back on track. This year, the court will celebrate its fifth graduation. “I had a female veteran who had drug and alcohol problems, but after going through the program she said the court saved her life,” added Judge White. Veterans are referred by a team of people—probation officers, judges, prosecutors, public defenders, Veterans Affairs outreach specialists—who believe they would benefit from a treatment program instead of punishment. Once accepted, veterans must plead guilty to their crimes, which can range from drinking under the influence to drug possession to domestic violence. Participants then agree to complete a 12-to-18-month treatment plan that may include entering a residential treatment center, counseling, random drug testing, and regular check-ins with probation officers. Once veterans successfully complete the program, the judge dismisses their criminal charges and seals their criminal records. Currently, statistics on the effectiveness of veteran courts is limited. Some courts have tracked the number of veterans who’ve successfully completed the program since its inception, some courts only have data for select years, and others are still too new to produce any meaningful data. However, if Senate Bill 339 passes through state the Assembly, the Legislature will appropriate funds to the Judicial Council to conduct a research study on the effectiveness of veteran courts. Nevertheless, some court leaders measure their effectiveness in other ways. Many judicial leaders attribute veteran courts' success to creating mechanisms and an atmosphere that is familiar to veterans. In Judge Chittick’s courtroom, flags from all five branches of the military hang on the wall. Proceedings open with a flag salute and Judge Chittick addresses participants in a formal manner. But according to Judge Chittick, pairing participants with volunteer mentors who are also veterans, is the most effective component of the treatment court. Mentors help participants in a number of ways, including attending court proceedings and serving as a support system. “The thought is to mimic parts of what is really effective in the military and transfer it over to the court system,” said Judge Chittick. Michael Roosevelt, a senior analyst at the Judicial Council who provides technical support to veteran courts, echoed similar sentiments about the mentor program. “When vets talk to vets, courts are most successful,” he said. In the fall, Judge Chittick will have her first veteran to graduate from the program. Next graduation, she hopes to have more. Currently there are 20 veterans in the program. San Joaquin County Veterans Treatment Court graduate Wayne Wells (read story).